It kind of already does. Some people even complain about the bottle being too full. Edited by beak, 05 May 2011 - 07:54. Smarty! My vote for a representative color would be between #4 and #5. The first 3 look too new or newly painted. In the pic of #3 you can see the depth of the layers of paint, #5 is sort of Quink/MB/Waterman Blue-Black, can't quite decide what color #4 is - Noodler's Bad Belted Heron? Edited by CatBookMom, 05 May 2011 - 04:26. Yeah - this is going to be tricky because all our monitors will be showing slightly different casts. My personal bet would be around g4 to h5. Yes that's William Hartnell - the first! I used to watch him from behind the sofa so the daleks couldn't see me. Shame that the Dr.s are getting younger all the time - I preferred the Dr. & assistant age-gap dynamic. Edited by beak, 05 May 2011 - 05:59. I think you could be right - I've edited to add 25 green across the swatches.This is serious stuff! Would you believe how much research has gone into the Tardis and its history - have a look HERE. Edited by beak, 05 May 2011 - 08:26. Thank you for all your effort in bringing us the pics and the color swatches. 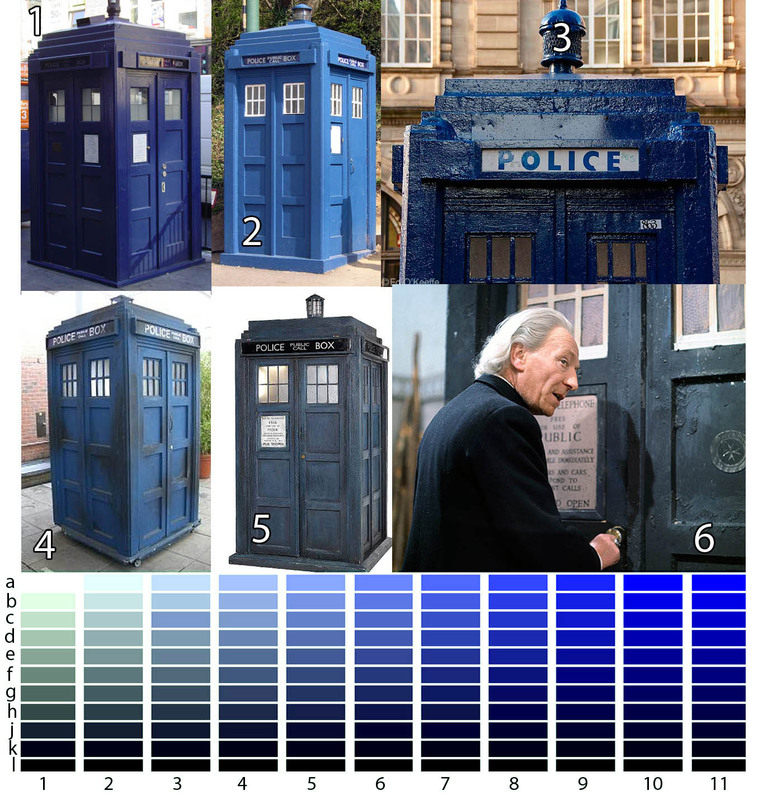 It all depends on when you were brought up watching the Doctor, I would say that I believe I'd have to pick the 4 column, and between G and H 4 would be what I consider the TARDIS color to be..
No sweat - this stuff takes only moments if you're used to doing it. You're right - take your pick from a huge range of screened examples! Too bad that the BBC owns the trademark to the name. What a great resource - hadn't seen that before. Noodler's Navy? Edited by beak, 06 May 2011 - 11:20. The Bottle! That's a great idea too. Never thought of a TARDIS shaped ink container. I really find it hard to believe that this was never discussed before. Probably the license fees would be impossible to overcome, but you do see a tons of Dr. Who stuff around now, so someone has been licensing it already. As long as nobody mentions 'Dr. Who', what's the prob? It's just a police box - no? That is one baaaaad paint job on Tardis #3. (Finally, something worse than my DIY kitchen cabinets!) Remember the Russell Stover's police boxes? We still have one, and Minipeanut uses it for the Tardis when he plays with his RC Dalek. Perfectly acceptable to do a police box, even in blue, as long as no one uses the T word. 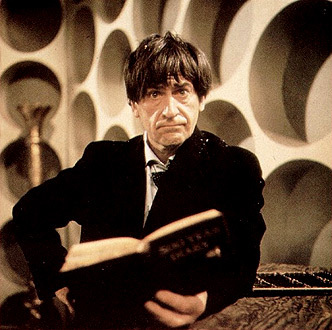 I like the color of the tardis when Pertwee was the doctor. Maybe Nathan could call it Pertwee blue. If Nathan of Noodler's is to make the ink, shouldn't it be called Tardiff Blue to avoid copyright infringement? Or should he get permission to use the name, then perhaps call it Tardiffs' Tardis Blue? PCB/ Tardis #3 looks like it was set on fire, put out, painted, set on fire, put out, painted blue with an old sponge, set on fire,.... too glossy too. Can't quite decide what color #4 is - Noodler's Bad Belted Heron? Is that a 1:1 mix of Bad Belted Kingfisher and Bad Blue Heron? Visit my collection of fountain pen articles at StefanV.com. I've been having trouble with those names from the beginning. It could be that I'm the first with the newly diagnosed ailment NNB, "Noodler's Name Befuddlement"
Edited by CatBookMom, 06 May 2011 - 18:30. 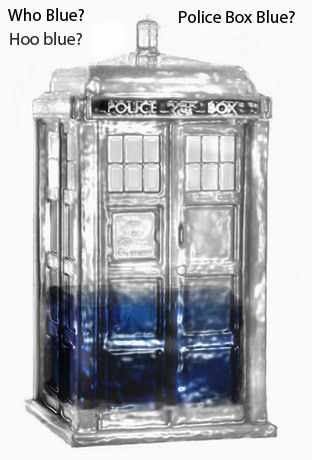 I think I already suggested "Tardif's Police Box Blue" as the name.... "Tardif's" is very very close to "TARDIS" Getting permission from the BBC would take way too much time and money, even money printed in Bernanke Blue. Well, I sent a link to this discussion to Brian Goulet; he might pass the idea along, after he stops laughing. You're going to have so much fun with the Swab Shop!